Guten Tag! EGEE reports for you today from Berlin, in advance of HealthGrid2009. Can this lesson be applied to the grid community? Hofmann continues: “Grid computing is essentially based on a paradigm that goes beyond borders [...] even though we are all belonging to one scientific community and a substantial fraction of our work is done in international collaborations, (e.g. EU-projects) we are still struggling with all sorts of borders in our day-to-day work as scientists.” HealthGrid 2009 will explore how to better integrate health and technology communities and your GridTalk bloggers are on the ground ready to report for you. One the eve of our arrival however (i.e. last night) we took the opportunity to see some of the city first. 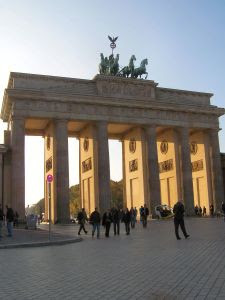 The Brandenburg gate (above) particularly impressed your EGEE-correspondent . . . bringing to her mind, as it did, flashbacks from many war-themed movies. 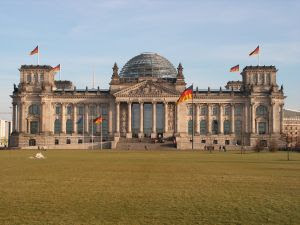 After dinner, we visited the Reichstag building – seat of parliament (left). If you are here in Berlin too don't miss this sight! For free one can visit the exquisite glass dome at the top of the building. At the top, a kind, grandfatherly guard will lend you an audio tour, which illuminates the history and architecture of prominent buildings in the surrounding cityscape. Fascinating, really well done and a perfect introduction to this beautiful city. Sprechen Sie später!